A variety of nicotine replacements are available. 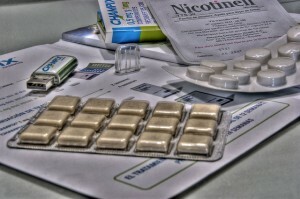 Usually, medicines are especially helpful if you smoke half a pack (10 cigarettes) or more per day. If you smoke less than half a pack per day, talk to your doctor and decide whether medication may help. Some medicines have nicotine to help heavier smokers quit, and they might make you feel weird if you are a lighter smoker. If you are pregnant or breastfeeding, talk to your doctor about medications that may be available for you.